As I mentioned in my 25 facts about me post I have a few piercings. At the time of writing that I had 4, all in my ears. 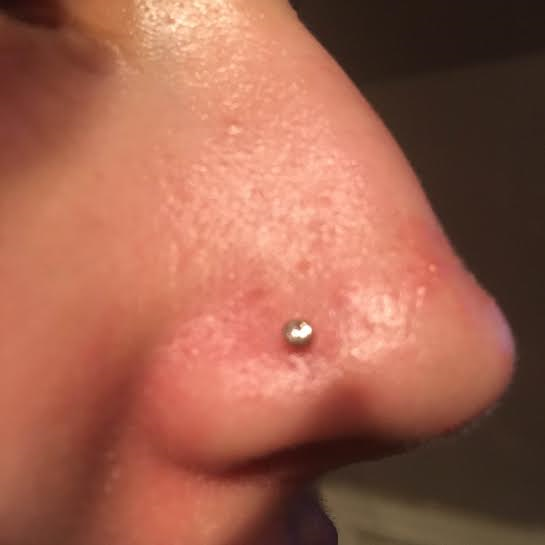 Three weeks ago I finally got my nose pierced after begging my mum for the past two years. Persistence is key. So I thought I would talk through all my piercings, how painful I thought they were and show you some pictures. First up is the piercing I have in my right ear. I only have my first lobe piercing on this side. 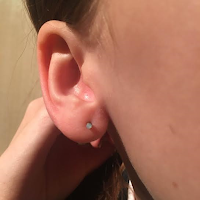 The first lobe is probably the most common piercing and I got mine when I was about 5 years old. For that reason I don't remember how painful it was but most people find it pretty painless. Next is the piercings in my left ear. I also have my first lobe on this side. As well as that I have my tragus, which is the one in the middle just above my firsts. I got this done July 2015, a few weeks after my 14th birthday. I have a pretty low pain tolerance so this I would give a 7/10. But it all just depends on how you deal with pain. I just have a plain hoop in here but when I got it pierced there was a stud put in. The last ear piercing is my helix, that's the one near the top at the back. Again when I got this pierced the piercer put a stud in it but since then I got it changed to this really cool star shaped hoop. This was slightly less painful than my tragus at a 5.5/10. I got this piercing in December 2015. Last but certainly not least is my nose piercing. This was surprisingly not as sore as I thought it was going to be. My right eye, which is the side I have it on, just watered a lot which I was expecting. As it's only three weeks old I still have the stud I got it pierced with but when it is fully healed I might change it to a hoop. I would give this a 4/10 on the pain scale. So that's all my piercings. For now. 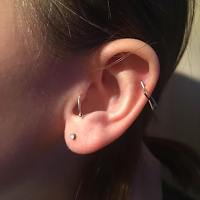 I got most of my piercings at Fearless Needle which is an amazing tattoo and piercing parlour not too far from where I live. Let me know if you have any piercings or tattoos, or if you want any. Speak to you soon! I reaaaaally want my tragus pierced but I'm scared haha! My friends have all said that it hurt them, but I've had my nose, belly, top ear and tongue pierced so I may just have to go through it!